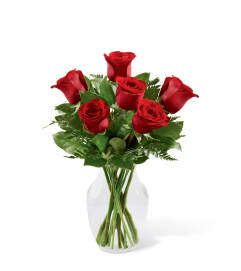 FTD® proudly presents the Garden Terrace™ Bouquet by Vera Wang. 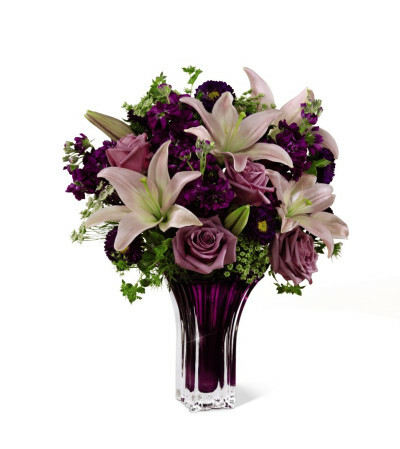 You’ll understand why the world flocks to Vera Wang for her singular interpretation of romance when you send this bouquet that gorgeously evokes the purple shadows of twilight. 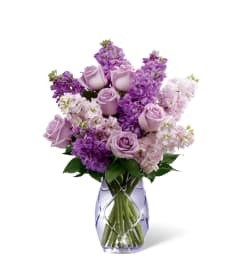 Lovely lavender roses, pink LA Hybrid Lilies, fragrant purple gilly flowers, purple matsumoto asters and Queen Anne's Lace accented with lush greens are presented in a sparkling, heavy purple glass heirloom quality vase. Perfect for a birthday or to celebrate any special occasion any time through the year.